It can be tough to get cheap flights to Seattle, but knowing what to look for and where to find it can help you get cheap airfare no matter where you're from. First of all, all the major airlines are served at the Sea-Tac airport, so no matter where you're coming from, you're sure to find a flight that will get you there. However, even though there will be plenty of flights available when you get ready to buy your tickets for your trip, there are some things to keep in mind, especially now with discount flights to Seattle harder to come by. First of all, if you can choose the time of the year you want to go to Seattle, you will be able to find cheaper flights. For example, remember that there are a few months during the summer when the rain calms down a little and there is more sunshine. So not only do airline prices go up on major holidays such as Christmas and Thanksgiving, but they can increase from June-August. We've gone to Seattle during different times during the year and while we've always checked online to find the cheapest flights, it seems that Southwest Airlines has always been the cheapest airline. I know that a lot of people don't like flying Southwest, but when you fly with kids, it's a great airline to fly. The reason I like it is because not only is it usually a cheaper solution, but families with kids don't have to wait in line or try and get there early. Instead, they can board early and be the first people on the plane. There are a lot of different sites out there than search different airlines to find cheap airline tickets. However, be aware that after you see the prices for the flights on the mega-search sites, go and check out the price of the same flights on the airline websites themselves because they can sometimes be even cheaper. While there are a bunch of different sites out there that you can use, the absolute best site for cheap flights is Kayak.com . It searches about 140 different airlines and you can look at prices from surrounding airports and different travel times. It's similar to sites like Orbitz and Expedia but I like the layout a lot better. 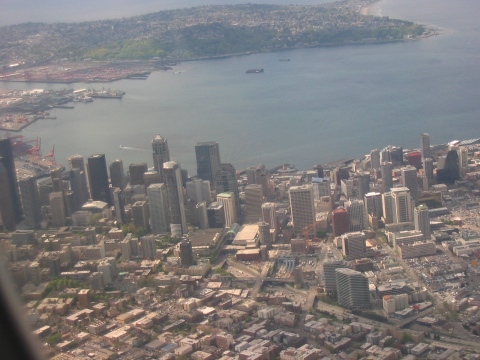 Try it out when you plan your next flight to Seattle. Back from cheap flights to Seattle.